Is the Welsh Terrier right for you? Welsh Terriers are quick little charmers. The Welsh Terrier is always on the hunt for adventure as an instinctive chaser. Their dense, wiry coat offers a distinctive look but needs regular brushing. Hailing from Wales, the Welsh Terrier was bred to hunt badgers, otters, and foxes. 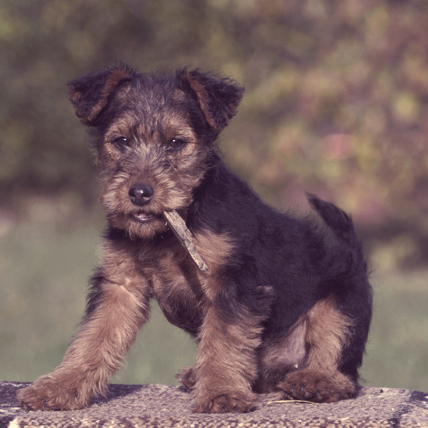 A close relative of the Black and Tan and the Old English Terrier, the Welsh Terrier became popular for their exceptional ability to flush small mammals out of their dens by going down and rooting them out. Welsh Terriers look a lot like the more common Airedale Terrier, with the boxy head, wiry top coat, small eyes, and slightly forward facing droopy ears. Their back is flat and their front legs are strong and straight, with little paws. Their angular body gives them an almost rectangular look. A curious and lively breed, Welsh Terriers are great dogs for an active family. They are great with kids and are always up for a good roughhouse. They also love playing outside or in the water. They should be well socialized and trained to make sure they are safe to be around small animals. They do best with a strong but calm owner who makes the rules clear and does not give them too much wiggle room, otherwise they may begin to think they can disobey you without repercussions. The Welsh Terrier's jacket is black, spreading up onto the neck, down onto the tail and into the upper thighs. Their legs, quarters, and head are clear tan, which is a deep reddish brown color. Some have grizzle jackets, as well. White is allowed only as small marks on the front of the breast.